We are excited to announce the release of Easy Computer Sync v1.5. With this release, you can now drag and drop files and folders between computers, using the high transfer speeds of the USB 2.0 Easy Transfer Cable. This upgrade is provided free of charge to all of our customers. To access the drag and drop feature, just go through Easy Computer Sync as you normally would. When you get to the selection screen, hit the Drag and Drop Files button in the lower left corner. This will bring up the screen shown above. From here you can drag and drop files and folders between computers. The top portion represents the computer you are currently on, and the bottom portion shows the connected computer. Simply drag and drop files and folders to start the transfer between your computers. You can then return to the synchronization screen by hitting Return to Sync, or just close the window to close the application. As part of our efforts in giving back to the community, we’re pleased to announce that starting today, May 5, 2010, we are now giving away free software licenses to charities and non-profit organizations. If you are a non-profit organization or charity, we would like to help out with free licenses for Bloat Buster and Easy Computer Sync. Also, we have similar offers for high school/elementary school teachers, anyone wanting to demo our software to a group of 15 people or more, and for bloggers/journalists who want to write about our products. Thanks for all the great feedback we’ve received from you, our valued customers! You’ve asked for several new features in Easy Computer Sync, and we’re happy to announce that Easy Computer Sync 1.2 is now available for download from our website. • A new “My Desktop” sync item is presented on the selection screen. Several people have asked to be able to synchronize documents and folders stored on their desktops. • The ability to resolve conflicts by automatically picking the “newest” file (that is, the most recently modified file). • The ability to synchronize folders in more “protected” areas of the system, including C:Program Files, C:Documents and Settings, or C:Users. If you want to just synchronize one subfolder in My Documents for example, you can now do so. There is a new checkbox in the “Add Folder” screen which lets you view these protected folders. Bravura Software announces Easy Computer Sync, a data synchronization product for Netbooks. Using the USB 2.0 Easy Transfer Cable, it provides the fastest possible transfer speeds for most Netbooks and Laptops. REDMOND, Wash. –(BUSINESS WIRE)– Bravura Software today announced the release of Easy Computer Sync, a software program that allows users to quickly and easily synchronize data between two computers using a USB 2.0 Easy Transfer Cable. Designed specifically with the Netbook user in mind, it provides the highest possible transfer speeds for most Netbooks and Laptops, with transfer rates of almost nine times the speed of most wireless connections. “Easy Computer Sync takes the guesswork out of synchronizing data”, said Bravura Software CEO Matthew Block. “With Easy Computer Sync, you don’t have to deal with network settings, firewalls or passwords. Just plug in the Easy Transfer Cable, and go. You can quickly synchronize your data folders (such as ‘My Documents’ or ‘My Music’) with an easy to use wizard interface. Not only is it easy to use, but it’s also the fastest way to get data on or off of a Netbook”. Bravura Software predicts that Easy Computer Sync will be a hit with Netbook users, who make up the fastest growing segment of the PC market. Because of its high transfer speeds and user friendly interface, Easy Computer Sync gives these users a solution to their common problem: how to keep data synchronized with their Netbooks. Until now, Netbook users had no quick and simple way to transfer many gigabytes of movies, music, or other data. Essential as a back to school accessory, Easy Computer Sync enables students to quickly synchronize important documents and schoolwork between their Desktop, Laptop, Netbook, or a friend’s computer. Because Easy Computer Sync doesn’t require any network or Internet access, it works well for people on the go. 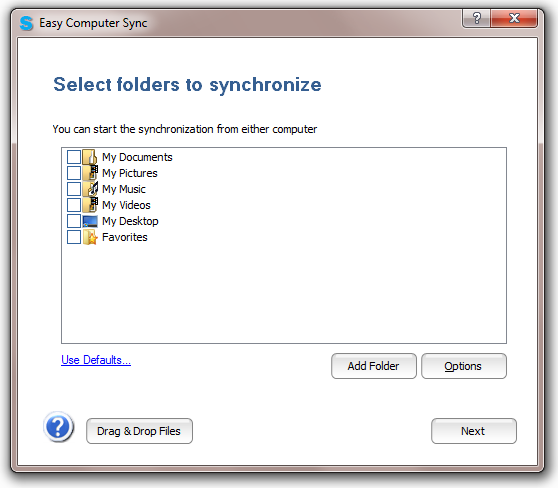 Easy Computer Sync is available for purchase directly from Bravura Software at http://www.easycomputersync.com/. It is sold either with an Easy Transfer Cable ($39.95, with free shipping), or by itself ($19.95 as a digital download) for users who already own an Easy Transfer Cable. These transfer cables are also sold at all major electronics stores. Founded in 2007, Bravura Software is a privately held company based in Redmond, WA. It designs and publishes easy to use software for the PC market. Bloat Buster reaches 10,000+ downloads! Since its release on April 15, 2009, Bloat Buster has already reached ten thousand downloads! We’ve just started this blog, where we’ll keep you up to date with the latest developments at Bravura Software!